New! Amazing Value for Quality Indoor Outdoor Wide Width Shoes and wide slippers all in one. This shoe fits large. Wear these as outdoor womens shoes or indoor womens slippers. The wide width helps accommodate bunions, hammertoes, corns, edema, swollen feet and swollen ankles. Wonderfully comfortable cushion memory foam insoles. Fully adjustable closures. These walking shoes feature slip resistant soles. 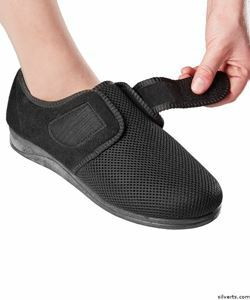 These black shoes with a hook and loop fastener by Silvert make a great gift for those searching for shoes for elderly seniors.